In 1976, psychologist Bruno Bettelheim (28 August 1903 – 13 March 1990 [by suicide]) published a book entitled The Uses of Enchantment: The Meaning and Importance of Fairy Tales. [i] In The Uses of Enchantment, Bruno Bettelheim tells about the importance of fantasy in the life of unhappy children. Fairy tales belong to the realm of fantasy and, consequently, give unhappy children hope that a fairy godmother will come to their rescue. From that point of view, i. e. the importance of enchantment in the life of a troubled child, it is perhaps best that the wounded child read fairy tales as opposed to fables, fables being a lesson or didactic. Puss in Boots is a fairy tale and is therefore a fantasy rather than a lesson. In fact, in an earlier re-telling of the story, Puss licks away the third son’s acne. That’s marvelous. As well, Puss befriends the third son. According to Bettelheim “being befriended by [an animal]” is among those “events” that can “lead to great things” (p. 73). As for fables, animal fables, as I have just noted, they may fail the troubled child in that they teach lessons. Fables are considered didactic. I cannot disagree with Dr Bettleheim, but let us reflect on the differences between fables and fairy tales. second, that the re-teller (author) of a fable tells a story and that, however real a story may appear, it is still a “story.” It therefore should not have too direct an impact on children, including unhappy children. In fact, making a story seem real is difficult. Roland Barthes calls the device used to make a story real “un effet de réel.” Now, if creating an “effet de réel” is not easy, when animals talk, the universe of fables and animal fairy tales may well be more hermetic, or distant, than that of fairy tales featuring persons. If such is the case, a troubled child is not likely to be harmed by reading fables instead of fairy tales. In other words, animal fables are a particularly oblique (dire sans dire) or indirect narrative, which may indeed be a factor in their seeming less “real.” Most of us have heard children commenting that the clumsy animal protagonist of a story they have read is, indeed, rather clumsy. They, the children, would never leap without first looking. So children tend to dissociate themselves not only from animals, but also from a fictitious dramatis personæ (the cast). Indirection is a dépaysement. Bettelheim writes that “the fairy tale’s happy ending occurs in fairyland, a country that we can visit only in our minds” (p. 133). He is writing, in other words, that fairyland is an “elsewhere,” (un ailleurs) and that we, including children, know that it is. So it would be difficult for the child to identify fully with the denizens of fairyland, particularly if the cast is made up of animals. Animals automatically create a barrier between the story and the reader. It would seem that dépaysement, or feeling you are in another world, is greater when animals, rather than humans, are used as characters in a story. 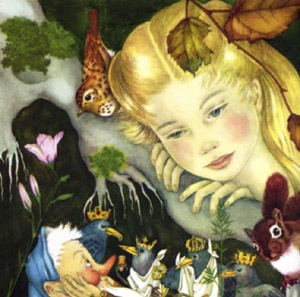 Animal fairy tales may well be more distancing, or more “otherwordly,” than fairy tales featuring human beings. If Puss is made to wear boots, I believe there is a motivation to introduce an element of magic in the fairy tale. The storyteller confirms we are in fairyland, not to mention that real animals do not talk national languages. Yet, if animals create a dépaysement, they are also like honey to a bear (or is it a bee?). Animals catch the attention of children. Children like animals. It would be my opinion that we must take into account the Horatian (8 December 65 BCE – 27 November 8 BCE) prodesse et delectare (Ars poetica). Fables instruct and delight, and vice versa. If there is fantasy in fairy tales, fables delight while instructing. So the difference between the two genres may not be that important. Johann Amos Comenius (28 March 1592 – 4 November 1670) was particularly concerned with pleasing the child. As you know children’s books are usually illustrated which is also consistent with the Horatian “to instruct and delight.” Now, if fables are written so they provide instruction while giving pleasure, the illustrations might well enhance the pleasure. In a sense, my choice of Malcolm Arthur’s and Fred Marcellino ’s re-telling of Puss in Boots[ii] had very much to do with the illustrations. In fact, I bought the book and showed it to my students to underline the importance of illustrations. They are pleasurable and therefore condition the child’s mind, and the adult’s. Finally, fairy tales may not be overtly moralizing, but some, if not most, contain a lesson. The third son of the miller did not look beyond appearances. He didn’t see that the cat he had inherited was a person in disguise and very clever. As well, the third son had the good fortune of watching a very smart cat, a cat who knows how to be successful and takes his master from rags to riches without the intervention of magic. The text does not indicate whether or not he received magical bottes de sept lieues. Yet, the cat’s ingenuity has been the foremost agent of change. Besides, the cat himself has changed. 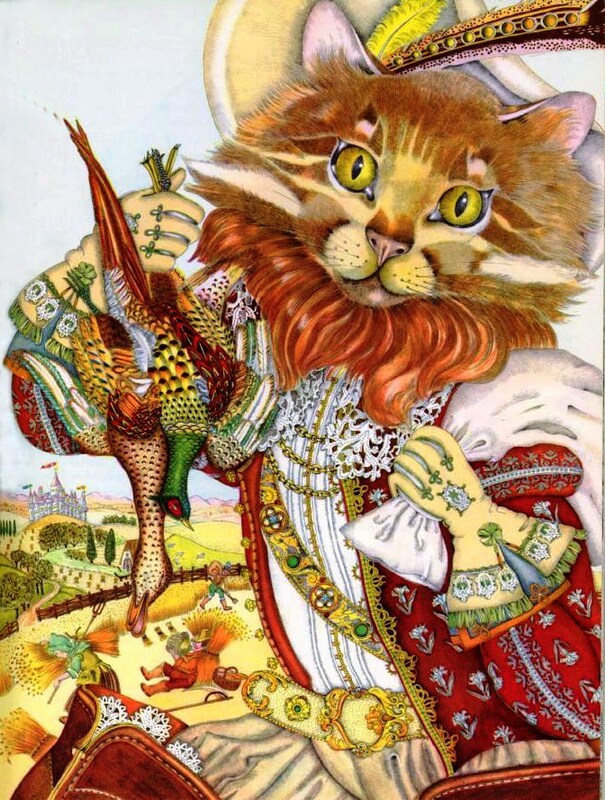 Marcellino’s last illustration, shows a portrait of Puss dressed like an aristocrat, which underscores his having been successful, successful to the point of being less of a cat and more of a human We are told, moreover, that Puss no longer eats mice, except for sport, i.e. humans hunt. So two mice, standing on the floor, are looking at the picture admiringly. It is as though they could recognize that Puss himself had risen while making the miller’s third son a prince. In fact, Puss deserves nearly all the praise in making his master an aristocrat. One therefore wonders what the third son would do without his cat. P. S. The video I had placed at the end of this post has been removed. It consisted of illustrations of fairy tales by Adrienne Ségur. These are available online. Please click on the word illustrations. The current video tells the story of the fairy tale. It does not mention Italian authors Francesco Straparola‘s (c. 1480 – c. 1557) Il piacevoli notti (The Facetious Nights) (1550–1553) and Giambattista Basile‘s (1566 – 23 February 1632) Lo cunto de li cunti overo lo trattenemiento de peccerille, or Il Pentamerone. It does not mention Charles Perrault, but refers to the 17th-century in France. Fairy tales are the product of Salons. [i] (New York : Vintage Books and Random House: 1989 ). [ii] Charles Perrault, Malcolm Arthur, translator, and Fred Marcellino, illustrator, Puss in Boots (New York: Farrar Strauss Giroux, 1990).